Jessica Leake, author of the epic, mystical Beyond a Darkened Shore, is back and better than ever with another romantic historical fantasy, Through the White Wood. And guys? We are OBSESSED. Drawing inspiration from Russian mythology, Through the White Wood follows Katya, a girl with terrifying powers who, in a fit of (justified, tbh) rage, kills half her village, shattering their bodies with the fearsome ice that fills her veins. As a result, she’s banished to the mercy of the grand prince, a young man whose reputation is more deadly than Katya can imagine. Rumor has it, he’s building an army of people with powers, people he can use to take over the rest of the world. Once she reaches Kiev, however, she is surprised to find that the prince is just like her—with the ability to summon fire. Together, Katya’s and Sasha’s powers are a fearsome weapon. But as their enemies draw nearer, will fire and frost be enough to save the world? Or will Katya and Sasha lose everything they hold dear? Are you as pumped for this as we are?? We can’t WAIT for you to fall head over heels for this epic fantasy like we have—and you’re in luck! 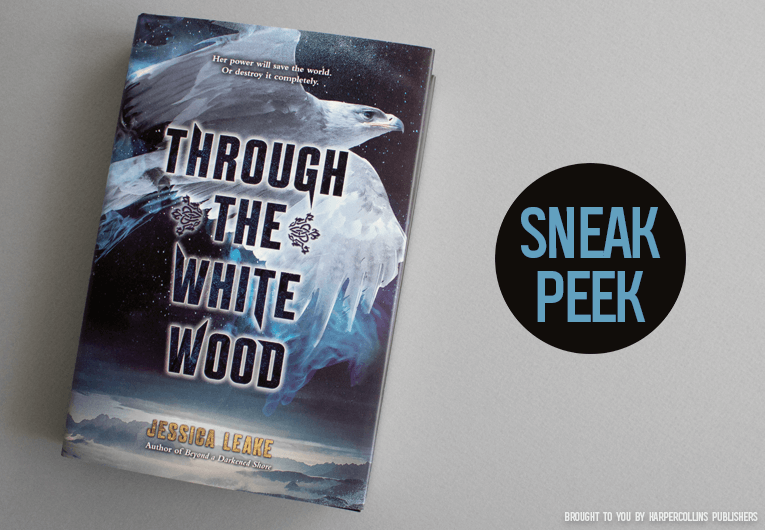 We’re giving you a sneak peek of the first three chapters of Through the White Wood. You’re welcome, book nerds, and happy reading! Though Babushka’s eyes weren’t as cruel as the others’, she did nothing to protest my treatment. Pain as sharp as ice pierced my heart. Did she condemn me to my fate? A shriek above us drew our attention. An enormous golden eagle was swooping toward us, talons outstretched. No, Elation, I thought desperately, and the bird banked and rose again to the sky. But her gaze remained on me as she circled above. I wouldn’t be the reason for more deaths or injury in this village—not even to save myself. My attention returned to the sleigh, from which the driver had stepped down. Anatoly hurried to meet him. “Please,” I begged again, and I wasn’t sure who my pleas were directed toward. Tears fell from my eyes and froze upon my cheeks. All too soon, Anatoly beckoned for Yury and Peter to bring me forward. I fought them until I was half-dragged all the way to the side of the sleigh. “She is kept bound?” the driver asked, his dark eyes narrowed. “She has escaped once already,” Anatoly said, lip curled beneath his beard. It seemed now when anyone looked at me, it was with a sneer or a curled lip. The men held tight to my arms, but I turned back toward Babushka, desperate to speak to her one last time. I didn’t think she would—didn’t think that I even deserved the chance—but to my surprise I saw she was making her way toward me, leaning more heavily on her gnarled walking stick than I’d ever seen her do. She shook her head as she came beside me. “We don’t have time for that now, devotchka.” I searched her familiar face, wrinkled and worn and stern, wondering if I’d ever see it again. “If you stay here, these men will kill you,” she said, her voice a desperate whisper, and I strained to hear her. “There is hope in Kiev. Sometimes the place we do not want to go is the best place for us after all.” I tried to puzzle out her meaning—I couldn’t imagine she thought my destination would be good for me by any stretch of the imagination. Was it an old proverb, then? She touched my face, her skin rough from years of hard work. I waited—whether for explanation or forgiveness, I didn’t know. But the village men would not wait for an old woman’s words, nor did she seem to want to offer any. Before I could say anything else, Yury and Peter dragged me to the side of the sleigh and threw me into it, so that I stumbled and nearly fell. I glanced back at their faces, triumph and relief plain to see there, and I knew they felt glad to see me go. Babushka stayed close to the sleigh, her lips pressed tight as though she was in pain. I thought of the sleigh’s eventual destination at the grand prince’s palace, and the frost on my skin turned to ice. He waited as though expecting some sort of answer from me, and as I looked around my village—at those who had arranged all of this, who wanted me gone—I knew I had no other choice. Not right now—not unless I wanted to unleash something better left chained within me forever. I settled for nodding once. I hesitated, wondering why I was being given such a thing. What use did a prisoner have for fine clothing? But he only handed it to me more insistently, so I reluctantly pulled it on. The fine fabric would hide my rougher peasant clothes from view, but even its heavy wool would do nothing to keep the cold wind from biting deep. Then, without another word, he climbed into the driver’s seat, gathered the reins, and pulled us away from the only home I’d ever known, to a prince they said was a monster. Babushka stood apart, looking frail and alone. I could still feel her hand on my cheek, her words in my ear—were they absolution? I am not your babushka, she’d told me long ago, but you may call me by that name. My life with her had not been easy or warm, but at least it had been mine. I turned to face the front of the sleigh and squeezed my eyes closed. I thought I’d known loneliness, but it was nothing compared to this . . . this utter exile. The cold seeped in, hardening my already icy skin, and I wrapped my arms tighter around myself. I tried desperately not to think of the one time I had felt warm, the only time I hadn’t felt as though I was carved from ice. But the memories surfaced anyway. Screams echoed in my mind as the tingling reminder of the cold fire crept over my palms. That terrible power that was nothing like my usual ability. I pinched my arm to keep the sensation from spreading, but it did nothing to stop the memory of how I’d felt that night. How I’d felt none of the nagging feelings of guilt . . . only blissful warmth. Above me, my golden eagle let out a soft cry, and as I glanced up at her, my spirits lifted ever so slightly. Elation, I’d named her long ago, because she never failed to bring me joy. Now she followed the sleigh from the sky, and I suspected she was my only remaining friend and ally. You deserve it, the nasty part of my mind said to me, the one that sounded like the village children I grew up with. It will be a fitting punishment for what you’ve done. We will not execute you as you deserve, the village elder had said, dressed in his long black shuba—the bearskin coat he was so proud of. Instead, we will hand you over to the prince. He’s always searching for people with your abilities, he’d said with a look of disgust. Let him deal with you as he sees fit. Standing in the elder’s own izba, the clay oven blazing with a warm fire that could do nothing to pierce my frozen skin, I had paled at the announcement. But Babushka—I’d stuttered, trying to think of anyone who could save me. She has agreed to it, Elder Anatoly had interrupted, his voice brooking no argument. of a smile. And you will deserve it, Ice Witch. While I swayed with the images of such violence, the man on the other side of me had added, I’ve heard he does it slow, cutting you and letting you bleed into a golden cup. Either way, Andrei added, dark eyes flashing, you’ll be dead. Deserved punishment or not, I couldn’t contain the shudder of fear that wracked me as I was held captive in the prince’s sleigh. I glanced at Ivan. He sat tall and straight, his steel-gray hair covered by a black fur hat. I stared at his broad back for a moment, an urge for contact moving me—to at least ask him why I’d been given the coat—but the wind was too strong, and the moment passed. I will jump, I thought, my gaze shifting to Elation in the sky. As always, she seemed to understand and flew lower to meet me. My heart raced in my chest, pounding painfully against my ribs. I could see in my mind’s eye what would happen: I would jump, and run, and Ivan would stop the sleigh and follow. What would I do then? A flash of the destruction my power had wrought on the village lit up in my mind, and I winced. Again, I thought of being brought as a criminal before a prince everyone said was a cruel and heartless murderer, and I knew my mind was made up. I gathered myself to jump as we rounded the next bend, my skin hardening at the anticipation of hitting the snow at such a speed. And then a heavy hand landed on my arm. I yelped in surprise, jerking my head up to find Ivan’s eyes trained on mine. My mouth went dry. With his other arm, he pulled the horses to a stop. The icy cold spread all over my skin, hardening it to marble. He climbed down from the sleigh and came over to my side. I met his gaze from my lofty perch, the blood pounding in my ears. “I didn’t want to have to do this,” he said, and I flinched in spite of myself when his hand moved. He reached behind me and retrieved a length of rope. It was attached to the sleigh by a metal ring, and as he gathered the rope, I gritted my teeth. Elation, I thought, and the eagle flew to my side. Ivan watched the eagle impassively, as though it wasn’t a creature with talons and a beak sharp enough to tear him apart. as often as furs, and as they traveled along the breeze to the far-flung villages, they couldn’t always be trusted to be accurately retold. I couldn’t know for sure what power he was gifted with, but it was the veiled threat to Elation that stopped me. “Do you understand?” he asked. After a moment, I nodded. “Then I won’t have to restrain you,” he said with a terse nod to himself. He coiled the rope again and replaced it. The sleigh dipped under his weight as he returned to the driver’s seat and urged the horses on again. Elation stayed by my side on the seat, her gaze trained on Ivan, as though she’d like nothing better than to rip the flesh from his bones. I held her back; Ivan’s threat weighed heavily upon me. What if his power was as terrible as mine? What if Elation was harmed—even killed? I shuddered to think of such an outcome. I never wanted to be responsible for the death of someone I loved again. the sleigh gliding smoothly over the snow. As I watched the dark forest on either side, far from any other village or town, my thoughts turned to my last failed escape attempt. The men in my village had hunted me like hounds and caught me just as easily. I’d meant to stay awake that night as I fled, and I thought I’d almost succeeded, but I fell asleep near dawn. A single cry from Elation woke me, the light from the weak winter sun turning the sky a pale peach, my small cooking fire long since died out to ash. dark and found another place to hide, but I was as terrified as a flushed-out hare. Elation had tried to help me. She had swooped down on them, talons outstretched like she meant to hurt them—maybe even kill them in my defense—but I’d cried out and stopped her. My heart twisted in my chest as I remembered the looks in the villagers’ eyes: like I was a creature they’d thought docile, only to have it turn out to be a mad dog. As they knocked me to the ground, my skin had hardened defensively, but gone was any trace of the terrible power I’d unleashed on them only the night before. Bound and physically weakened, I was dragged back to the village. I’d felt only relief that they hadn’t killed me then, but I feared now, as I sat in Ivan’s sleigh bound for a malevolent prince, that what they’d chosen instead might be far worse. Because there was another rumor about the prince, one that was far more frightening than all the others: that he had murdered his own parents while they slept, naming himself grand prince before his father was even cold. And now he was gathering people with power, people who could help him take over the rest of our snowy-white world. I had no hope that such a cruel prince would pardon me for what I’d done. My crimes against the villagers were enough that I would surely be sentenced to death, but as I rubbed one hand across the thick wool of my coat, I wondered if the prince had a worse plan for me: To make me join his dark army. I glanced down at my hardening skin—which was turning to ice at the darkness of my thoughts—and wondered just how long my natural defenses would hold out before I, too, was killed. After traveling until the sun hung low in the sky and the chill in the air took on a vicious edge, Ivan finally slowed the sleigh. I sat up a little straighter, taking note of our surroundings. We were still deep in the forest, enormous pine and fir trees on either side of us, no hint of a city nearby. Babushka taught me at a very young age not to ask stupid questions, so I didn’t ask whether we’d arrived at our final destination. It was clear that we had not. Ivan slowed the horses to a plodding walk, and up ahead in a clearing, I saw the points of tents with small gold flags flying from their tops. The sounds of men and a large, crackling fire greeted us, and our horses perked up noticeably. So many others waiting for us made my shoulders tense. I’d become used to Ivan’s silence—at least enough that I no longer feared he would suddenly attack me—but I didn’t relish walking into a circle of strangers. I said nothing, only glanced at the sky to be sure Elation was still with me. It took me a moment to find her, but then I saw the gleam of her feathers against the green of the pine trees. I closed my eyes in relief. She had flown away on our journey once or twice—presumably to hunt or find water—and each time she returned I was nearly moved to tears. Ivan guided the sleigh to the very center of the camp, so close I could feel the warmth from the fire, and then jumped down in a surprisingly agile way for his age. He held his hand out to me as a small company of men surrounded us. I forced myself to meet their eyes unflinchingly even as memories of the last time I faced a contingent of men threatened to drag me under. I nodded once even as my mind raced ahead. As frightening as they might be, raiders could provide the chaos I needed to get away. I had enough knowledge of the woods that I could keep myself alive; I could find food, at least, and shelter, and make a fire. I wasn’t helpless. And I had Elation. I came back to myself only to find the men still staring at me, their air expectant. Only then did I realize that they had been asking questions I’d failed to respond to. “Is she mute?” a man with a pointed sable beard asked with a sneer. “Is this the power we’ve sought? The only woman in Kievan Rus’ who does not speak?” His close-set eyes narrowed slyly as he laughed, making me think of Sergei and Rodya— brothers in my village who’d taken great joy in tormenting me. “Right. I’ll take the girl to her tent,” the man with the pointed beard said, and I felt my heart sink. Grigory grabbed hold of my arm, but my skin immediately turned to ice, and even beneath my thick coat, I think he could feel the blast of cold. He dropped my arm like a hot coal. “Follow me,” he growled. I kept my head held high even as my stomach quivered. Would they restrain me again, as my villagers had? I hadn’t used that terrible fire again on my villagers, even when they’d captured me. The thought of using it here and now entered my mind, a little shudder of horror going through me. Never again did I want to be responsible for that much death and destruction. We walked past the roaring central fire, and I noticed an iron pot steaming with some sort of stew. A few of the men sat around the fire while still others tended to the horses. Several tents were set up in a half-circle around the fire. But Grigory led me past all of these. My skin grew increasingly icy until my breath came out in plumes of cold air. “You see!” he shouted, practically in my face. I tried to yank away, but he held me tenaciously. she was probably older, though not by much. I wondered how I hadn’t noticed her approach. “What are you doing, Grigory?” she asked, and her accent immediately identified her as from the steppes in the east. There was a traveling trader who sometimes visited our village who was from that far-off place. I remembered his face, wrinkled and kind. Grigory’s mouth opened and closed several times, leading me to believe he was as surprised to see the girl as I had been. Grigory’s unprovoked anger at me had been strange enough, but the fact that he seemed most upset about my supposed lack of powers both confused and worried me. As far as I knew, I was being brought before the grand prince for sentencing. But there had been no mention of that so far—only my power. Were the rumors about the prince seeking out people with abilities true? invocation of the prince’s name was enough to dissuade him. “Ivan needs your help with the sleigh,” she added. Grigory shot me a look but thankfully relented. It wasn’t until he was well on his way back to the entrance of camp, though, that the ice on my skin receded. Warily, I continued to follow her until we arrived at a round tent that could easily sleep five men comfortably. “Here we are,” Kharan said, gesturing toward the enormous tent. “It’s . . . beautiful,” I said truthfully, gazing up at its deepblue sides trimmed in gold. As I looked closer, I saw that gold stars had been embroidered throughout, so that the whole thing resembled the night sky. She held aside the front flap, and I found I didn’t even need to duck my head to enter. Once inside, my boots sank into plush silver fur. The inside of the tent was nearly as elaborate as the outside, with tapestries, a wide bed with richly brocaded blue-and-gold coverings and a midnight black fur, a small table with a bowl for washing, and two ornately carved chairs. I hadn’t seen such finery in all my life; Babushka’s humble izba was furnished with far less. “I don’t understand,” I said, and it was the confusion that made a prickle of unease trace down my spine. I was being brought before the prince as a criminal, yet I was given my own lavish tent? Her answer so surprised me that I let out a quiet, self-deprecating laugh. “Does he value monsters so highly? Murderers, too?” Perhaps he did, if the rumors about him were to be believed. My gaze continued to roam before finally landing on a chest big enough to hold a full-grown man. Inside were garments that glittered like gemstones: deep carmine, sapphire, emerald, and lighter colors like jade, aquamarine, and topaz. I could tell from a few feet away that they were all heavily brocaded and embroidered, trimmed in fur and silk. one I’d always been so proud of, now looked like what it was: peasant clothing. Even my lovely red wool skirt with what I had always thought of as intricate white embroidery might as well have been moth-eaten compared to the fine garments within that chest. “Surely this is too much for someone like me,” I said, my eyes still on the chest. The gowns were lovely—lovelier than I’d ever seen, but they were intimidating in their beauty. All this for a prisoner? But I thought I knew the reason for such finery, and the whispers of worry in my mind intensified. Were the tent and the gowns bribes? Was the prince trying to entice the poor peasant girl to join his dark army with gifts of more value than she’d ever seen? I also couldn’t help but fear, like Kharan’s kindness, that it was some terrible deception. Like the old tale of a witch in the woods feeding children all kinds of delicious treats . . . only to fatten them up and eat them. Because these were clothes fit for a boyar’s wife, not a peasant like me, I responded in my head. I didn’t know what to say, other than I knew it couldn’t simply be out of the goodness of his heart. He had to have a purpose for treating me so well. I just wasn’t sure I wanted to find out what it was. A rustle at the flap of the tent drew our attention, and in the next instant, the flap was blown aside to reveal Elation swooping over our heads. Kharan took a step back, surprise and alarm clear on her face, but then Elation landed on the top of one of the chairs, perching there as though it was especially for her. A moment passed, and the three of us stared at each other, one after the other. The strangest urge to laugh gripped me. “I hope this eagle is yours and not some poor confused bird who has mistaken this tent for her tree,” Kharan said finally. Finding that the prince and I had birds of prey in common did nothing to comfort me. I didn’t want to see him as human at all. Not with such a beastly reputation. I wanted, suddenly, to ask her opinion of Prince Alexander, but something stayed my tongue. Kharan might have been courteous, even friendly, but I also couldn’t forget to whom she owed her loyalty. Keep your own counsel, Babushka always said, and so I did. I said nothing, my hand gently stroking the soft feathers on Elation’s head. “How long has the eagle been with you?” Kharan asked. “For as long as I can remember.” The eagle had appeared one day in the woods just beyond the village, where I often gathered herbs, and had watched me, but I’d thought nothing of it. Until she was there the next day and the next, and then I’d find her watching from the trees closer to the village— her beautiful golden eyes interested and, to my lonely mind, friendly. It had seemed just a figment of my imagination, really. But soon I began to think of her as my friend. I’d started talking to her then. First, only in my own head, but later, in whispered confessions. It wasn’t until recently that she had shown any sign other than her constant vigilance that she cared for me at all. I thought of that dark night in the woods, alone and hunted, terrified of not only my pursuers but of my own self—of what I’d done. The eagle had descended from the sky like the firebird of legend, her feathers illuminated by the glow of my small campfire. She’d brought me a hare. She kept me alive. But most of all, she offered me what I wanted most: companionship. When she left, I took better note of my surroundings. I ran my hand over the softness of the fur on the bed, examined the comb made of bone upon the small table, and ultimately found myself drawn to the chest of beautiful clothing. Whoever had packed the chest was clearly familiar with dressing wealthy ladies, for it was filled with not only the gowns but with glittering jewelry, embroidered and gemstone-studded belts, silky veils, and two woolen cloaks trimmed in fur. Three pairs of slippers were included, each more impractical than the next: two made of soft deerskin and one of gold silk. I glanced down at my leather boots lined with rabbit fur that, while not as pretty, were much more capable of handling a sleigh ride through the snow. More important, it was Dedushka who had made them for me. It’s usually the city dwellers who wear boots, he’d said one cold night when he’d returned home with doeskin and rabbit fur, but I thought you should have a pair to keep your feet warm when you’re in the woods. You’ll spoil the girl, Babushka had said, eyes narrowing in disapproval. Get her used to a life she can never have. Dedushka hadn’t responded for a moment, only continued to sharpen his skinning knife. It won’t hurt to give her something special for once. Babushka shook her head but didn’t argue anymore. For her, that was as good as giving her blessing. very center of our izba. Many times had I woken from my small cot by the window to find her already awake and weaving, her gnarled hands still agile enough to work the loom. It was the herbalism, though, that she’d passed on to me. We’d spent countless hours in the forest beyond our village, searching for everything from pine needles, which could bring down swelling in the body when brewed and drunk as a tea, to violets, which could be used to help relieve congestion in the chest. After gathering the herbs, we’d return home and spend hours categorizing. I didn’t have much skill in drawing, but I learned to draw and write well enough to keep a journal of medicinal herbs and their uses. Yet another thing that had been left behind when I’d been exiled. I thought of our izba now. It was small, and nothing compared to this celestial tent, but it was beautiful in its own way. The eaves and window frames were carved with woodland scenes: deer and leaves, squirrels and nuts and berries. The elegant lines of a horse head watched over the many people coming and going from the ridgepole of the roof. Dedushka always said he’d carved it for good luck. It hadn’t brought him luck in the end. Elation made a little whistling sound, and I went to her side. She closed her eyes and leaned her head into me, and I did the same. Long after the sun had set and the candles had burned down nearly halfway, Kharan returned with water. I’d spent the entire time wondering about my fate and trying unsuccessfully to understand why I’d been thus far treated like I was a guest and not a captive, thoughts that left me anxious. She poured water into a copper cup and handed it to me. “Thank you,” I said, immediately taking a drink. “It’s a monstrous ability that I want nothing to do with.” My words seemed to fill the space around us, echoing like a declaration. I hesitated, running my hand over my frigid arm. The hunger within my stomach roared to life, reminding me that it had been at least a day since I’d last eaten. The moment I stepped outside, I took a deep, cleansing breath. The vastness of the sky above, dotted with countless bright stars, relaxed muscles I hadn’t even realized were tense. It was the same sky I’d seen from my izba, and from the forest beyond our village. As long as I can see the stars, I told myself, I won’t feel so far from home. Kharan led me toward a blazing fire, toward the rich smell of food, toward the low sounds of men talking. Before he could say more, though, he caught sight of us and paled under his scruffy brown beard. Kharan brought me a steaming bowl of the stew, a hunk of dark bread, and a mug of kvas. A bite of the stew revealed it to be just as flavorful as its smell suggested, with herbs and vegetables that made it both savory and aromatic. “This is delicious,” I said, and the man who was speaking when we first arrived smiled. “I did the best I could with limited ingredients,” he said. The others turned back to their meals, and I quietly ate mine. Slowly, they grew used to my presence among them, and conversations cropped up around me. They talked of ordinary things, work and family and hunting, and mentioned nothing of fire—cold or otherwise. And I was able to relax and enjoy my meal, the feel of a full stomach, the lingering taste of the kvas on my tongue. “How much farther to Kiev?” I asked. Not much longer, then, to enjoy my relative freedom. What would the palace be like? And the prince? I glanced up again at the stars above me. I winced at this as the others shifted uncomfortably. In just those few words, the relative camaraderie I’d been enjoying around the campfire was shattered. “I did hear it, and we’ve heard many tall tales like that before,” Grigory said, and again, the ice began to spread over my skin. “Grigory, not again.” The warning came from Kharan, who shook her head in an attempt to silence him. I stayed silent. Why answer? What was the point? I knew Grigory’s type: they trod on anyone they considered weaker than them just to inflate their own egos. “Is that a tear I see shining in your eye? Did I touch on a sore spot, dearie?” Grigory continued with a laugh. the village, though, these thoughts so disturbed me that I came suddenly to my feet. “By all the saints, that’s enough, Grigory,” Kharan snapped. Eager to escape, I thrust my bowl at the cook and mumbled my thanks. My hands shook as the ice in my veins grew stronger, colder. Just because I had power didn’t mean I had to use it. accommodations and good food, I wasn’t being watched. The moment I set foot outside, they would track my every step. There is one way I could escape, I thought, but then I shuddered violently and pushed such malevolent thoughts aside. I couldn’t do that. Not even to save myself. I answered by pulling aside the flap for her. She held up two mugs of kvas and a piece of fine cloth. “Pryaniki?” she offered as she opened the cloth to reveal four glazed cookies. The sweet smell of honey and spices wafted up. They were my favorite; I could practically taste the sweet gingerbread now. At home, they were a special treat that I only ever got to eat at Christmastime. “This is kind of you,” I said, and stepped aside so she could enter. Kharan came in and sat on one of the many furs carpeting the ground, folding her legs under her. I joined her, and she handed me one of the mugs. She placed the cloth with the cookies closest to me, and I took one and bit into it. “They’re very good,” I said with a small smile. It was rather shocking to find out that not only Ivan had power, but Kharan, too. “What is your ability?” I asked as she took a sip of kvas. I was almost afraid to find out. I didn’t wish my own ability on anyone else. Once, it had only made me the object of derision, but then it had manifested in such horrible destruction that the villagers had no choice but to turn me out. To me, abilities had always been something to be feared. It was odd to hear Kharan speaking of her own ability so lightly. Safe from what? I wanted to ask, but at that moment, Elation flapped her wings. I turned to look at her and could tell she wanted to fly. “She wants to hunt,” I told Kharan, coming to my feet. “I hope it allowed me to make amends for supper,” Kharan said with a smile. Kharan might have been loyal to the prince, but I found myself thinking of her as someone I could talk to. I’d never had someone I could confide in, not really, and especially no one close to my own age. There was something about her that put me at ease—not enough that I could confide everything; I didn’t think I’d ever feel that close to anyone—but at least enough that I wouldn’t fear for my life tonight. But tomorrow . . . tomorrow I would face the prince. I awoke before dawn, and for one blissful moment, I thought I was back in the izba with Babushka and Dedushka. But then I remembered. And once the memories began to flow, they were so painful that I pressed my eyelids closed with my fingers. Desperate to distract myself, I threw aside my bedding and fumbled around for the candle in its little golden holder. I’d left one candle burning, which was possibly foolish considering I was sleeping in a flammable tent, but I couldn’t bear to sleep in total darkness among men I didn’t trust. Besides, I knew Elation wouldn’t let me burn to death. She’d flown in again sometime after I’d gone to bed and perched on the back of the chair. Even now I could just make out the shimmer of her eyes in the gloom. I carried the smaller candle by my bedside over to the one on the table and lit it. As I cast my gaze around the tent, the clothes chest seemed to call out to me again. I walked over and stared at the beautifully embossed lid before finally opening it. The fine clothing waited there, even more lovely in the soft light. I glanced down at my rubhaka, now hopelessly wrinkled. Still, as I looked at the gowns, with all their many colors, I wondered which would be appropriate for travel. Would the gown look ridiculous over my boots? Should I wear a veil and the jewelry? What about the belt? that the prince himself had sent the garments. Perhaps it was merely to play a cruel trick on me, to have me arrive dressed in such finery only to be laughed and mocked. A rustle came at the entrance of my tent then, followed by a soft voice calling my name. Elation ruffled her feathers and turned her gaze toward the entrance. I walked over and held aside the flap. with golden threads embroidered throughout. She wore boots like mine of rough leather. “Yes, only I had the help of Babushka . . .” I trailed off as pain shot through my chest. I remembered her last words to me, and it made me desperate to go back, to speak to her again . . . to ask for the forgiveness I hadn’t received. Not trusting my voice with my throat closing on unshed tears, I nodded and managed a small smile. She led me to the campfire that hadn’t been stamped out yet, and as I ate and drank, I watched the men pack up the tents and various supplies on a wagon pulled by wide, shaggy ponies. My enormous tent was rolled and stored, the bed broken down, the chest hefted onto the wagon. Elation disliked the newly chaotic environment and took flight, perhaps to seek out something to eat, or to simply escape because she could. At one point Kharan left and went to the line of horses tied to low tree branches. When she returned, she was leading a wheat-colored pony. I watched with some surprise as she fed him some of her own kasha. “Is this one yours?” I asked. She petted him and I did the same, marveling at his thick coat. “He’s a hardy thing,” I said, and I could tell just from his flinty hooves that he was tough and reliable. “It takes skill to be fat even in winter,” I said with a smile. After a much shorter length of time than I would have thought possible—I had only just finished my tea and porridge—the contents of the camp were loaded. Ivan walked over to us, his steps quiet on the fresh snow. As if I have a choice, I thought, but nodded. Ivan had the sleigh ready, and he offered me his hand, roughened by cold winters and hard work, to help me into it. I settled down and drew my coat tight, nerves and fear churning unpleasantly inside me. Despite my treatment here, I knew I wouldn’t avoid facing the prince’s judgment. The punishment for death and destruction caused in my own village would be unavoidable. I steeled myself for what lay at the end of today’s journey. Kharan mounted Daichin beside me, and Ivan settled in to drive the sleigh, the two white horses stamping their hooves as if eager to be off. The other men formed pairs in front of and behind us without having to be told. Their horses were heavy battle chargers, and I thought uneasily of what Ivan had said about the road to Kiev not always being safe. Ivan signaled the lead guards to go on ahead, and then our sleigh was gliding over the snow, the sounds of jingling harnesses and horse hooves filling the woods. The sound was cheerful, but it made me think of chains. I couldn’t shake my apprehension, however amiable most of the guards had been to me. It was almost more frightening to be treated with compassion than to have been greeted with aggression. At least then I would have known where I stood. The luxurious tent and even Kharan’s kindness made me fear a trick—something I was no stranger to. I watched the snow-laden trees as we passed by, and it felt as though ice crystals were slowly forming over my skin. I had learned that kindness was usually cruelty in disguise, that those who grew more powerful from the belittling of others usually liked to provide their victims with something they could take away. As a prisoner who had been exiled by her village, I had so very little else that could be taken away from me. Only a month had passed since I’d lost control. It had never happened before. My power—if it could even be called by such a name—had only ever subjected me to mockery. Sometimes, I could do simple things with it, like freeze water into ice—not a particularly useful skill in winters as brutal as ours. And the village children I’d grown up with found it endlessly amusing to put me in situations they knew would result in me becoming as stiff as a corpse—anything from simple teasing to hitting me with sticks to see if I’d flinch. But that day was different. For one thing, I’d never been pushed that far before. Ironically, when I lost control, I wasn’t the one being targeted—the victim was the one person other than Babushka who treated me with any kindness: Dedushka. His given name was Lev, and he had once been as strong and respected as the lion he was named for. That was before he became a world traveler—long before he took me in. He and Babushka had wandered across the snowy world, making trade and accruing vast amounts of knowledge, particularly in the healing arts. But when they finally returned to the tiny village where they had first settled, they were treated with suspicion and disdain. The other villagers wrongly believed that because Lev and his wife had traveled far and wide, they then thought of themselves as superior to the humble people of the village. It didn’t help when they took in a babe left for dead in the cold winter woods—a girl with strange powers. Me. and eventually he could no longer work as he once had. Then it was his wood carving and stories that provided an occupation of sorts. He spun tales of far-off places we could never hope to see, of magic and monsters and creatures of legend, which held us all enthralled long into the night. On this particular evening, he’d sat by a fire, surrounded by young and old from the village. He told us of warriors who rode animals several times larger than a horse—war elephants, they called them. Enormous and intelligent, with more brute strength than a warhorse. He told of golden books detailing the strategy of using such animals, of how the Persians had once used them to terrify and destroy whole Rus’ military units. The melodic tone of his voice, the way he used his entire body to paint a picture of his tales—these traits made it impossible not to listen once he started talking. Though I could feel myself being drawn in, I had remained a safe distance away from the others, hovering just outside the warmth of the fire. Dedushka’s sharp eyes had landed on mine, and he grinned and beckoned to me welcomingly. “Come, join us, dear girl,” he said. Several eyes landed on me and narrowed warningly. The men were in a dark mood that evening already. At the mill, one of the chains holding the logs in place had rusted and broken, spilling many weeks’ worth of work. They would be picking up logs for days. “I’m fine where I am,” I answered, skin prickling. “Not for her,” Sergei said, the scar above his lip twisting cruelly with his sneer. Rodya, his brother and his friend, as always, followed his lead. “Not for the Ice Witch,” he said. “I don’t want her to think she’s anything other than a burden on this village,” Sergei said, his small eyes shifting to mine. “Go home, witch!” Rodya said, eyes flashing just like his brother’s. “Because we only want a bit of peace,” Viktor, Yury’s cousin, added with a shake of his head. The others were treating this casually, as though it was only a tantrum being thrown by a child, but I could read the danger in the air. It charged the space around us like the threat of lightning. I hesitated, but I didn’t want to leave him standing there alone. As I walked closer, Sergei leaped to his feet and grabbed me. “Let go,” I said as ice spread over my body. Sergei only grinned, knowing there was little I could do. “Enough of this, Sergei,” Dedushka said, his voice deep with warning, but we all knew he was no longer strong enough to be a threat. But then Dedushka surprised us both by reaching for Sergei’s arm. Sergei jerked it out of his reach, but in doing so he lost his hold on me. I spun away. The other men shouted as Sergei began to grapple with Dedushka. He knocked Dedushka down, and Dedushka fell painfully to the logs they’d been sitting on with an audible thump. I screamed, and something ignited within me. A rush of cold escaped from my outstretched hand, dousing the fire instantly. Everyone, including me, was stunned. Never before had my power done anything more than turn my skin cold and hard or freeze small buckets of water. A flicker of fear passed across Sergei’s face, and he reacted as he always had—by lashing out. “You see? He has brought a witch into our midst, just as I said!” He yanked Dedushka roughly to his feet before catching his brother’s eye. Rodya and Peter grasped Dedushka under each arm. Dedushka struggled to escape their hold, but he was no match for their strength. “What are you doing?” Yury demanded of Rodya and Boris. They ignored him and pushed past him unheedingly. “Then I will go to Anatoly.” And Yury left to find the village elder. When Yury left, it was as though the one voice of reason left, too. Even Viktor, who had spoken up before, said nothing now. The others who had been sitting around the circle, though they had stood when I’d doused the fire, did not speak. I couldn’t tell then if their silence meant they agreed with Sergei. But he backhanded me, the blow strong enough to send me flying to the ground, though the ice of my skin prevented it from causing me any real harm. They dragged him toward the trees at the very edge of the village, and I lurched forward to follow. The threat of violence hovered, a dark cloud infusing the men with cruel power. When someone produced the length of rope, I knew the threat would become a promise of murder. Dedushka fought them, wildly, but he could not escape their grasp. I pushed through the crowd of men, each of them flinching away the moment my hand made contact with them. I was radiating cold, so much that frost hovered in the air around me like an aura. “Let him go!” I yelled, snatching at Sergei’s arm. They made a noose and wrapped it around the old man’s neck. Dedushka cried out. Rodya wrenched my arms behind my back, and then it was difficult to say what happened next. I remember the ice in my veins spreading outward. I remember encouraging it instead of trying to stop it. The power bubbled up from within me like a geyser, cold and ruthless. As the men threw the rope over the branch, the cold fire burst forth in an explosion that illuminated the night sky. Blue in color, blindingly blue—brighter than the sky. My skin was hard as marble, shielding me from its cold. The men scattered with terrified shouts, but the blue fire clung to them, spreading over their bodies and consuming them faster than the hottest blaze. They shattered when they hit the ground. Some made it as far as the village, and the fire spread to the huts and buildings. It froze the carefully built structures instantly, and then the people living inside the izby shattered like shards of glass. Half the village was destroyed in an instant. But the worst of it was that Dedushka had been consumed just as Sergei and Rodya had been. I found his small body, broken in several pieces as though he was a statue instead of a once living, breathing man. I’d killed him as surely as if I’d fastened the rope around his neck. It was the suddenly increased pace of the men and Kharan on horseback and Ivan in our sleigh that dragged me from my dark thoughts. As the trees blurred by, and the horses’ nostrils flared, both with the effort to pull the heavy sleigh and to carry the men at such a fast clip, a sense of foreboding gripped me. If we were so close to Kiev—an easy day’s ride, as Ivan had told me— then why was such a pace necessary? The rush of wings close enough to ruffle the fur on my hood drew my attention. Elation had finally returned. She let out a low whistle and ascended rapidly into the sky, far above us. There, she banked, making a wide circle around us, one golden eye on me at all times. “Ivan,” I shouted, but my voice was swallowed by the wind. Still, his back and shoulders tensed noticeably, and he reached for his sword. Up ahead, a bend in the road revealed the reason for Elation’s agitation and the men’s breakneck pace. Armed raiders were pouring from the trees, a wave of men in ragged clothing with unkempt beards, their archers firing arrow after arrow over us as men on foot attacked our guards. The state of their dress and their dirty, unwashed faces made me think they were acting out of desperation. And desperate men were dangerous. Before long, we were forced to a jarring stop. Kharan was to the rear of the sleigh on her hardy little pony, and I feared for them both. The prince’s men surrounded the sleigh, shielding me with their bodies. An arrow zipped through the air, perilously close to the hood of my coat. Tension rippled over me, and my skin hardened into impenetrable ice, leaving me with a grim stoniness. The guards sprang into action around me, cutting down the raiders closest to them. The battle was loud and chaotic, the shouts of men and the twang of metal meeting metal. In the chaos, I lost track of Kharan. I resisted the urge to shout at the guardsmen to move away, to engage the raiders and not worry about me, but of course it was their job to deliver me to the prince in one piece. My earlier plan to escape during the confusion of the battle flitted through my mind, but as I looked around at the flying arrows and the flashing swords, I realized I hadn’t truly expected us to be attacked. Nor had I realized just how terrible a battle would be. From atop his perch on the sleigh, Ivan cut down one of the raiders—the horses plunging and rearing as raiders attempted to break them free from their harnesses. One nearly succeeded in pulling Ivan, and I fought the warring desire within me to come to Ivan’s aid. Not that way, I thought. Not when it could mean his death along with the raiders’. Boris wielded his sword like a knight out of a fairy tale, but even with his obvious prowess, more and more men surrounded him until I feared he’d be overtaken. Grigory fought raiders at the base of a tall pine tree, his blade somehow parrying the many that flew at him. Then something unexpected happened. Grigory raised his other arm, and the tree itself groaned, bending and swaying as if under a powerful wind. Next I saw the boughs smashed into the raiders closest to Grigory, sending them flying into crumpled heaps in the snow. I remembered then that Kharan had said others had abilities like mine, and I realized Grigory must be able to control the trees. Another arrow pulled my attention away from Grigory as it whistled past me and nearly hit its mark: Daichin. At some point he had lost his rider, and as he galloped out of the line of fire, I scanned the battle for Kharan. Finally, I saw her, not far from Grigory. She held a dagger to the throat of the raider who’d fired the arrow that narrowly missed her horse. In the next instant, he was dead, blood pouring from his throat. She turned to another threat: two more raiders, who circled around her with jagged blades. I thought of how kind Kharan had been to me, and the ice on my skin spread; the palms of my hands tingling with the temptation to destroy the raiders the only way I knew how. I shook with the effort to hold myself back. But then I remembered I had another option. I held out my arm, and Elation, though she had stayed far above the skirmish, dived at my call. The loud clash of swords still rang out, but Elation didn’t flinch. She glanced at me, her tawny eyes predatory. Waiting. “Blind them,” I said, and sent thoughts of her daggerlike talons tearing into the raiders. I lifted my arm in the air as she took off, her powerful wings carrying her toward the nearest cluster of enemies. Bloodcurdling screams greeted her outstretched talons as she tore into a man with a curved sword. As he dropped his weapon to cradle his face, she took off only to circle around again for another victim. Just then, something crashed into the sleigh, distracting me from Elation’s battle. I turned to find Ivan slashing the throat of one of the raiders who had managed to almost climb aboard. The raider slumped off the sleigh, the smell of blood coppery in the air. And then another raider succeeded in pulling Ivan from the sleigh. A group of four swarmed him. He took down the first man easily—a quick thrust with his sword, but as he parried the weapons of two at once, the third smashed him with his hilt. Stunned, Ivan fell back against the sleigh, dazed and unsteady. Several times he tried to regain his footing and failed. The raider grinned, and to my horror, continued forward, as though he would finish Ivan off. All around us, the other guards were being overwhelmed by the raiders. I could summon Elation again to come to Ivan’s aid, but it wouldn’t be fast enough. I could help him myself, possibly injuring him or even killing him in the process. Or I could do nothing. I shook my head—the last was not an option. I jumped from the sleigh. The raider nearest me was caught off guard. It gave Ivan some room, and he kicked free of the men. “Katya, no!” he yelled as I inserted myself between him and the men. He wrenched at my shoulder weakly, shouting for me to move out of the way, but I ignored him. Just do it, I thought. These are bad men—men who will kill you if the guards fall. I thought of my promise to myself: to never release the full extent of my power again. But it was our only chance. Surely it was necessary. I outstretched my arms and willed my hands to stop shaking. Burn, I thought, as the cold fire poured out of my palms.